This morning, Sean laid out and drilled a series of holes in his “running man” sculpture using Forstner bits on the drill press. 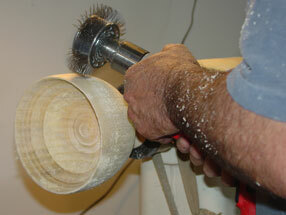 Later, Sean did more carving on the triangular walnut bowl. 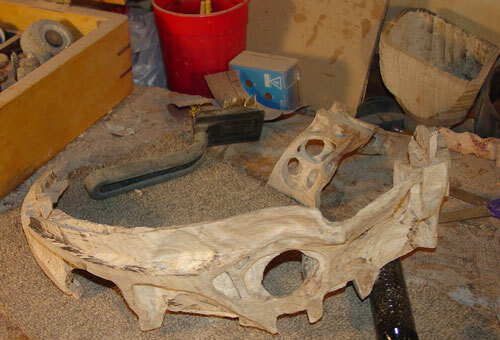 In addition to texturing the surface more, he has carved out recesses for the legs around the holes in two of the corners. 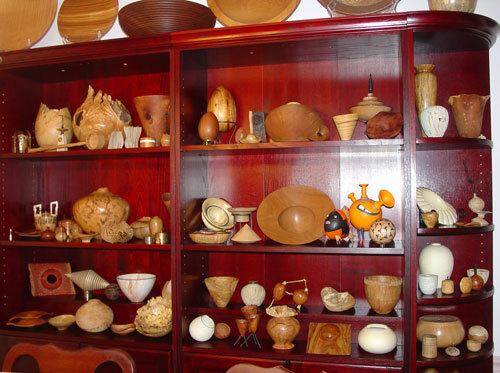 You can see two legs lying behind the bowl, one highly carved, one not—at least, not yet. 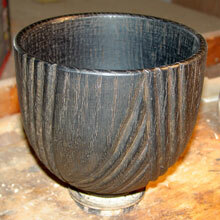 He also worked on his fourth oak bowl, carving the exterior and then adding silver or blue-gray paint. 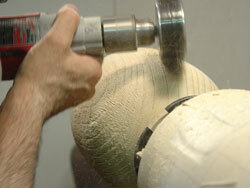 Below is proof that Jean-François does sand, despite all the carving and texturing he does. 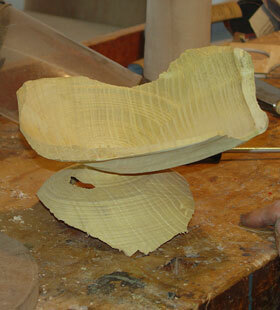 He has nearly finished (except for the foot) the first of this series of colored and carved oak bowls. In the lower photos, he is working on the second of this series. 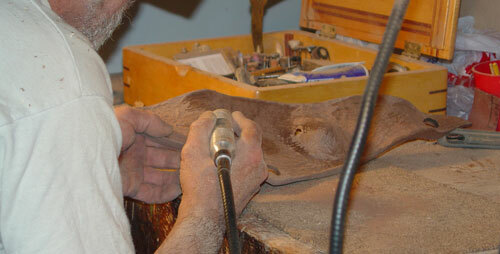 Again, he is using the Arbortech reciprocating carver to cut the grooves, which he then will touch up with a Foredom. 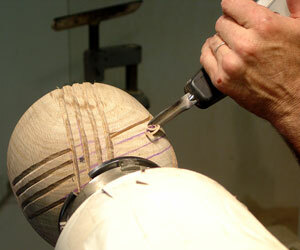 In contrast to the first bowl, Jean-François has used white acrylic paint to fill the grooves and open grain of the second bowl. I believe he has not finished rubbing out the interior in the final photo. 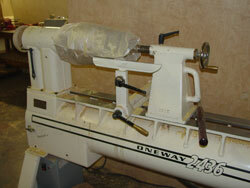 Siegfried was back in the shop today, but working at half speed. 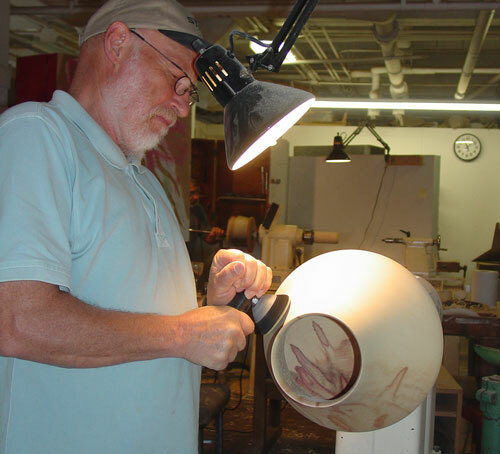 He continued working on inside-out-turned shapes, experimenting with an unorthodox means of shaping the pieces, on a belt sander. He is hoping that a good meal and some sleep will further restore his energy for tomorrow. I got to turn a lot today. 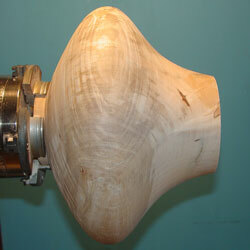 I finished the turning of my pear vessel, pictured below. 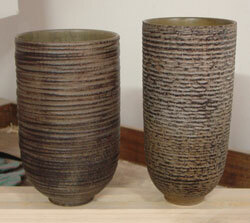 It has a round bottom that cups nicely in the palm. 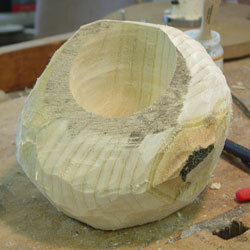 I have begun carving the mouth, as you can see, a departure from my previous work. 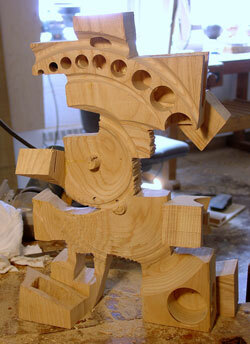 I will finish the carving after I pick up some new Dremel bits tomorrow. 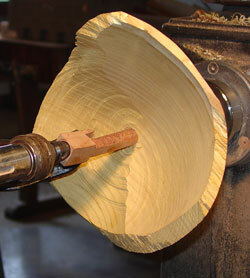 I also started a multiaxis cherry bowl, using four different centers on the bottom and keeping the same center on the top. I’m just playing really. My first go at it was unimpressive, but I went back and changed the curve and I’m beginning to like what’s emerging. I’ll work with it more tomorrow. Siegfried was absent from the shop this morning, and we soon learned from a phone call that he was at the hospital undergoing tests. He has not been feeling well the past few days, and he noticed that his heart was racing and wouldn’t slow down. (His pulse, which is normally around 60, was stuck at around 100–110 beats per minute.) The hospital did not find a reason for his racing heart, but they gave him something to slow it down. He came back from the hospital, but did not stay at the shop. We hope he will be back turning with us tomorrow. In the meantime, here are some of the shapes he turned yesterday using the inside-out technique. 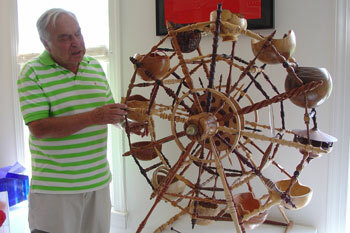 He is thinking of doing more and assembling them into a piece. Sean, the inveterate recycler, has taken two of the largest fragments of my broken mulberry bowl (see the post “Monday, June 18” if you don’t remember what I’m referring to) and turned them to create a new piece. 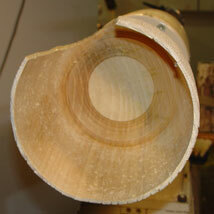 Below, you see two views of the larger fragment on the lathe. Sean kept shifting the center—four or five times in all, I think—to make different cuts. After turning the two fragments using multiple centers, he screwed them together temporarily to check their fit and balance. 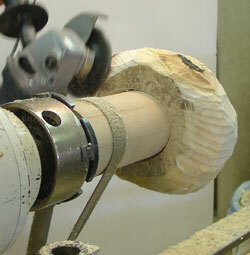 He liked what he saw once he aligned the grain in the two fragments, so he glued them up and clamped them in the lathe. He will carve them next. 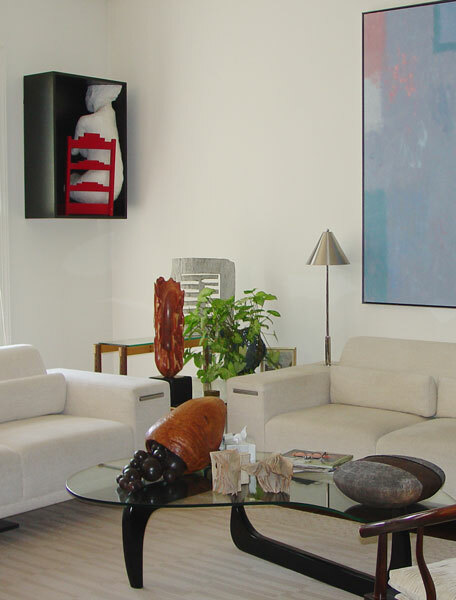 Remember the sculpture I called “the mascot”? It is done, except perhaps for another coat of finish. 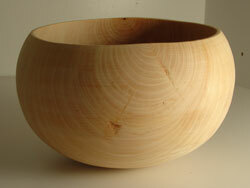 Here it is in a cupboard with Sean’s third oak bowl. This one has a dyed green interior. 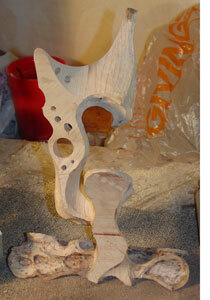 In the righthand photo below is the beginning of a new freeform sculpture. 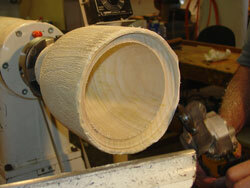 Sean has much carving to do on it, but you can see the grooves and shapes made already by turning the scraps. He sees in it a running man, but the name has been used too many times already, so he will come up with another title. 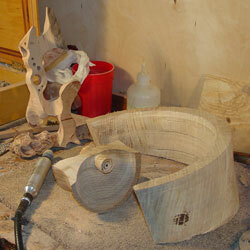 This is the current state of two of the oak ring pieces still to be assembled into a sculpture. 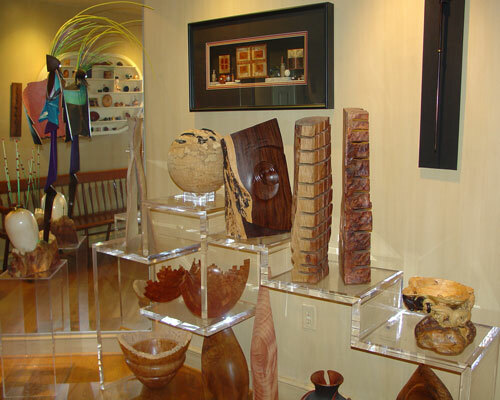 In the background to the right, you can see Sean’s fourth oak bowl, the last of the series. 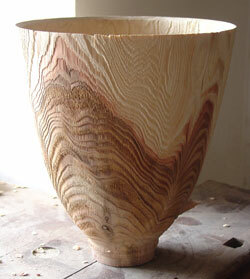 Jean-François turned a new oak bowl. 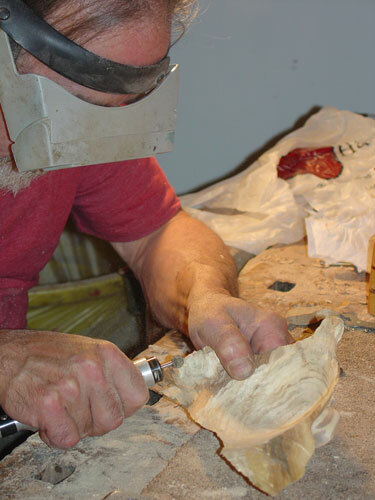 Having completed the turning (except for the foot), he is cutting grooves into the exterior using an Arbortech reciprocating carver, following lines that he drew freehand. You can see that he has already colored the interior using his favorite vinegar-and-steel-wool technique. Albert LeCoff came by the shop this morning with Phil Hauser, treasurer of the Wood Turning Center and himself a turner and a collector. 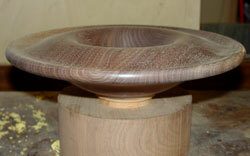 Here, he admires the bowl Sean turned of a walnut scrap. Besides following up on group plans with phone calls and email, I finally got to turn some today. 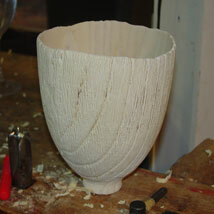 I turned most of a hollow vessel of wet pear (which is lovely to turn). 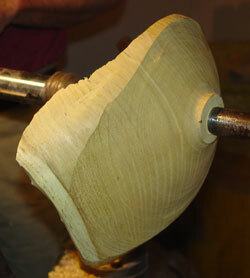 I plan to finish turning it tomorrow and to carve the mouth. Maybe I’ll get a photo tomorrow. It is pouring rain outside as I wrap up this post. Tomorrow, we can expect thunderstorms, a treat for an Arizonan. Okay, I’m beginning to try to catch up. I didn’t feel well enough to turn today, but I did make it into the shop, and here is what I found. 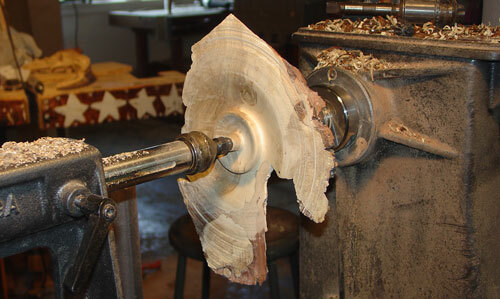 Sean was carving on a new bowl, from a walnut scrap, which will eventually have three legs; if you look closely, you can see holes for the legs in two of the corners. 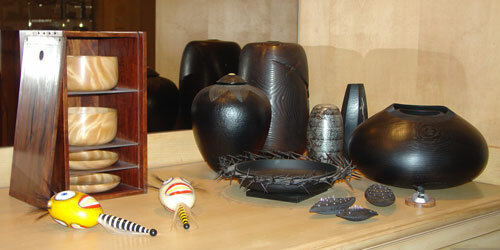 Above are some of the pieces Sean has finished; others are close to being finished. 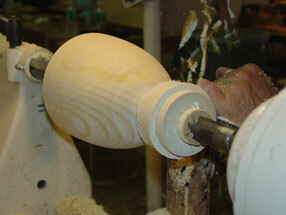 Below, a new piece is still on the lathe. Jean-François has been busy. 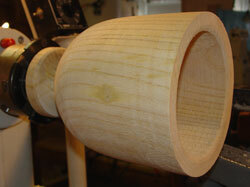 The lefthand bowl below is of cherry. 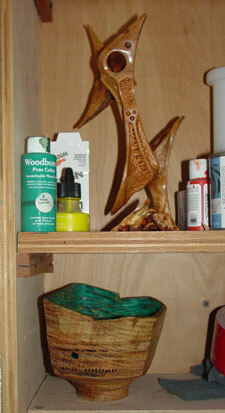 It was turned and carved with an Arbortech and touched up using a Foredom. 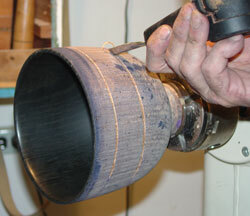 The color comes from Jean-François’s favorite coloring technique: rubbing with steel wool and white vinegar. 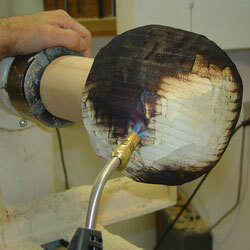 The steel and vinegar react with the tannin in the wood to darken the wood. 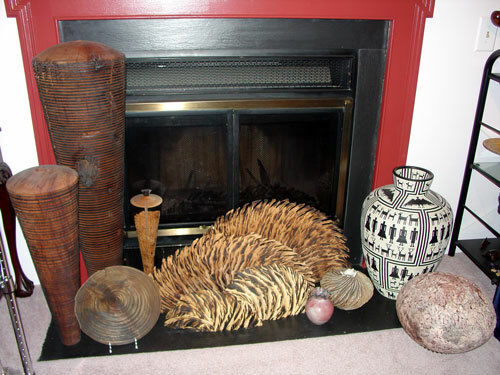 The actual color produced depends on the wood, its moisture content, oxidation of the steel wool, and more. 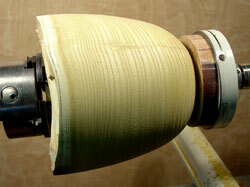 The righthand photo is of two bowls of maple, colored using the same technique. 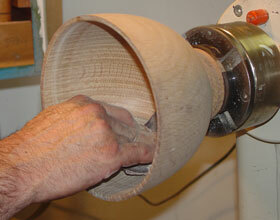 Here, Jean-François is completing the interior of a third maple bowl. Siegfried is experimenting with some inside-out turning. 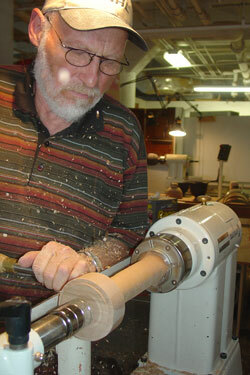 In the photo below, you can see lying on the bed of the lathe some prototypes he made before starting the box elder. 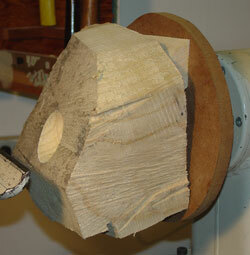 Above, you see the box elder after Siegfried has cut it on the bandsaw and placed the pieces face to face. 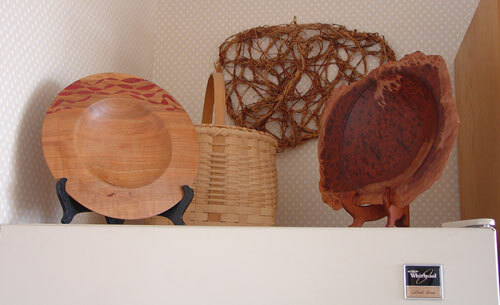 Above right is a Cryptomeria bowl that Siegfried turned yesterday and brushed aggressively to highlight the grain. Sorry for the silence . . .
dear readers, but I haven’t been feeling well since we returned from D.C. I hope to be back on my feet and back on the computer tomorrow, and I’ll try to catch up with more about our D.C. visit and see what the boys are up to in the shop. Stay tuned . . . So, what did we do in D.C.? 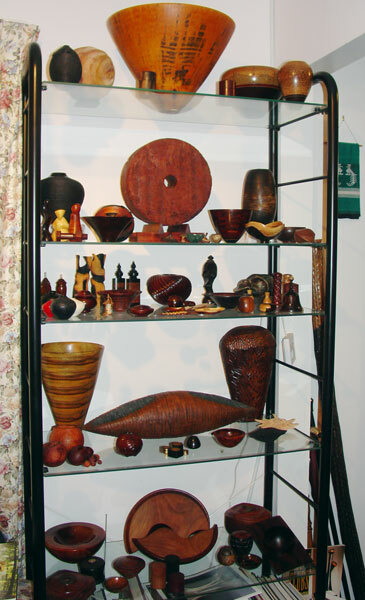 We saw some of the best turned wood art in the world. And not only did we get to see it, we got to touch it, hold it, turn it over, turn it around, stroke it, scrutinize it, learn about it, photograph it, savor it. And we got to see how many artists began and the evolution of their styles. 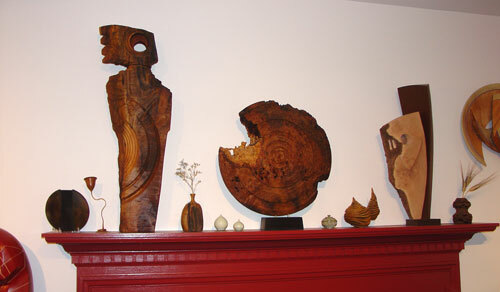 We also got to meet some people who really love wood art. 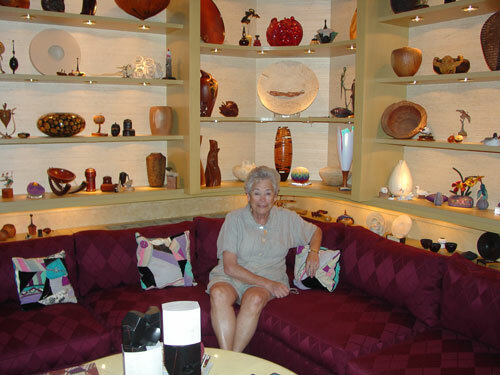 Seeing them with their treasures, hearing their stories—stories they have about each piece—was inspiring and affirming. 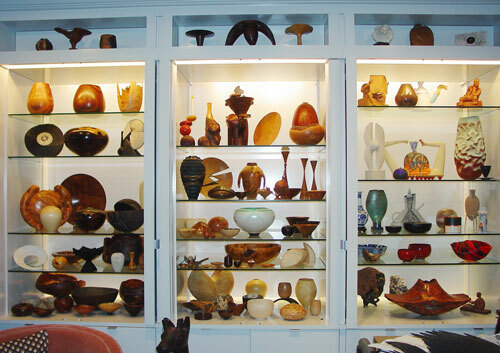 Their collections aren’t inventoried acquisitions; they’re a passion. More appreciative adoptive parents for your creations would be hard to find. This may be my last blog post for a few days. 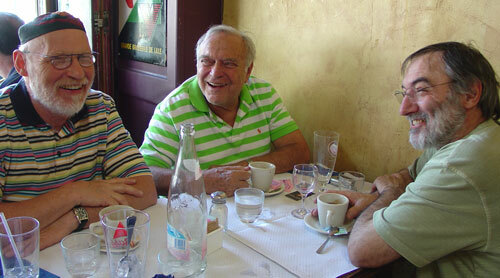 Jean-François, Siegfried, and I leave for Washington, D.C., tomorrow and will be gone through Sunday. 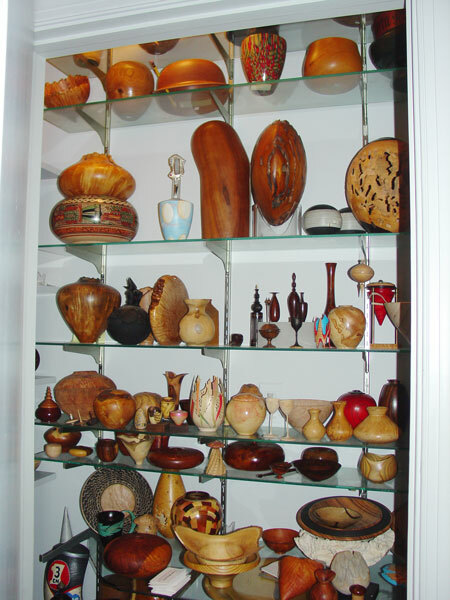 We will be visiting with several collectors of wood art: the Kochmans, the Breslers (who are generously putting us up for two nights), and the Masons, and also visiting the Smithsonian’s Renwick Gallery. Sean will be staying behind, because he cannot bear to be away from the shop for two and a half days. I will post as I can but have no idea what to expect in the way of connectivity—or free time. I spent all morning working on the blog and following up on our ITE travel plans. Here is what I found when I made it into the shop. 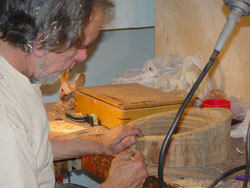 Siegfried was finishing the box elder vessel. 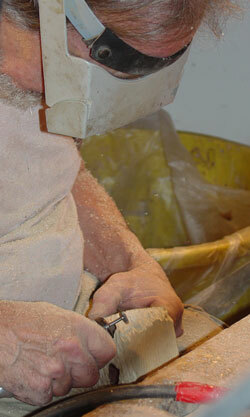 As you can see, he has cut to the final wall thickness and is sanding the exterior. 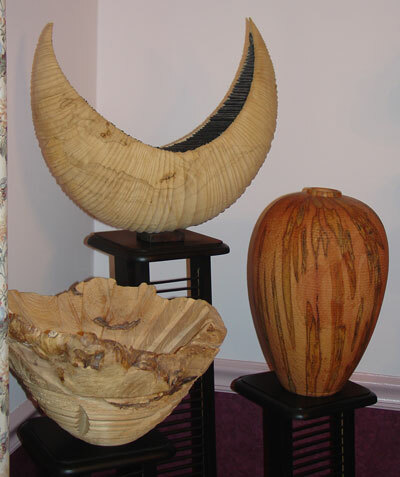 You can see the nearly finished vessel next to the nearly finished silver maple vessel he made earlier—“nearly finished” because he still has to turn their bottoms, which will be round. 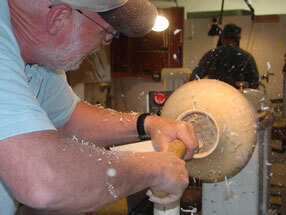 Sean was carving the vessel from yesterday. Curiously, he has decided that the foot is in the wrong place, so he cut it off and is gluing it in a different spot. 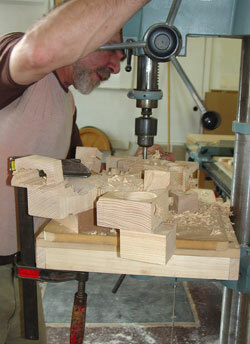 He has it clamped between centers, because there are no clamps here small enough. 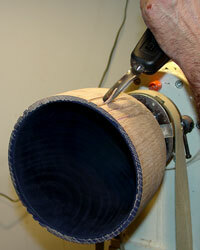 He has carved a cover for the drive center so that it won’t damage the bowl. 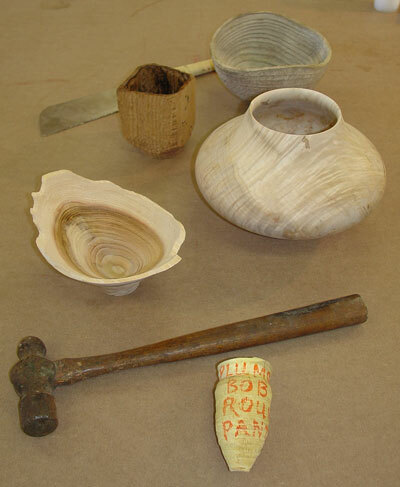 In the lefthand photo, you can see both his carving of the bowl and the stump of the original foot. Jean-François was working on a idea he has wanted to explore for a long time. 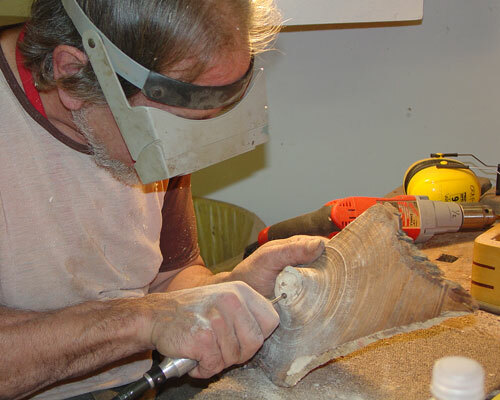 He mounted a chainsawn chunk on a makeshift faceplate on the lathe and hollowed a bowl without turning any of the exterior. 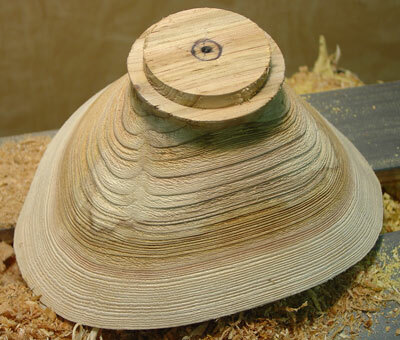 He then used the bandsaw to roughly shape the exterior, reverse mounted the vessel on a jam chuck, and proceeded to shape it further using an Arbortech with the lathe off. 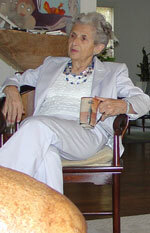 Note the strap in the righthand photo above. This is a loop that runs down to Jean-François’s foot. 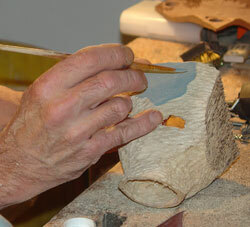 His foot pressure on the strap keeps the piece from rotating under the tool. When he wants it to move a little, he lifts his foot. 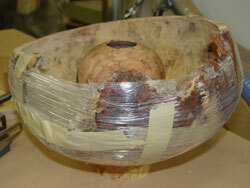 Here is the bowl in an interim state. 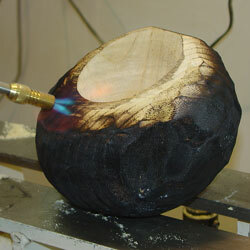 After shaping it further, Jean-François decided to burn the surface. The color of the scorching seemed to go more brown than black as it cooled. Jean-François will no doubt do more to this bowl before he is done with it. 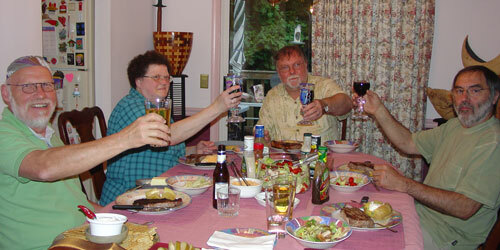 Work stopped for a while for our first weekly meeting with Albert and Tina. We set up an impromptu table in the shop, and Siegfried ordered pizza. As a starting point for discussion, Albert had us each choose one item from someone else’s bench, and then we started talking. I could hardly stop laughing. 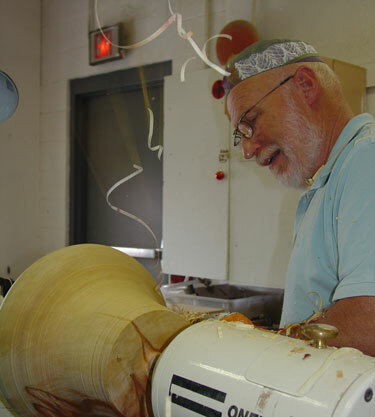 Am I the only woodturner out there who knows most of the words to the Sponge Bob Square Pants theme song? I don’t think so. 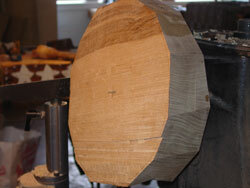 Today, Siegfried began a larger vessel of the same shape as the silver maple vessel, this one of box elder. He was shooting ribbons to the ceiling turning the very wet wood. 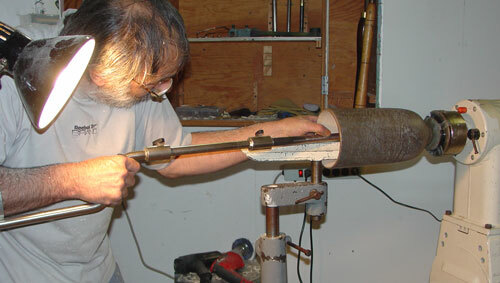 When he began deep hollowing of the vessel, he tried out the hollowing tool with the Stewart armbrace and Jean-François’s attachment. 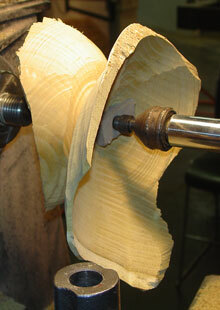 He says he enjoyed the experience, though he found himself switching back and forth between the tool and a heavy gouge. Yesterday, he tried out my Exocet tool. 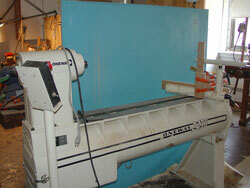 He regards trying new tools as one more of the opportunities afforded us by the ITE. So do I.
Sean gets tired of working on long, complicated projects, so today he decided to make a “fast” bowl from a cutoff. 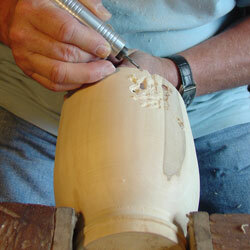 Here, he is already carving the foot. 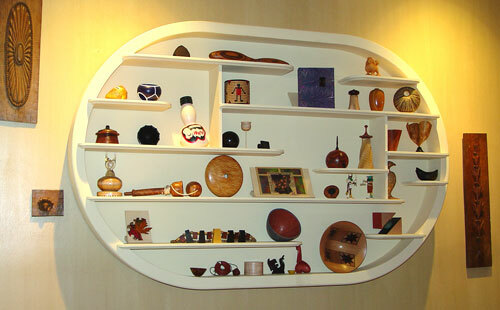 The photos below show the finished piece. Yes, the color is artificial. 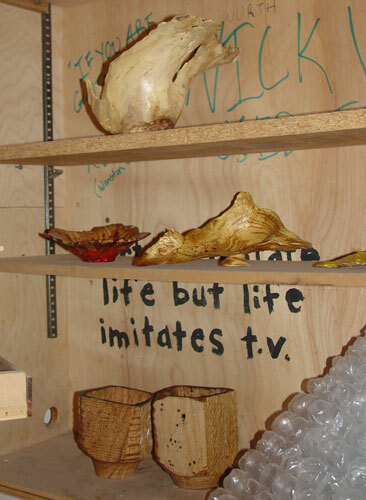 I have begun thinking of Sean’s sculpture as our mascot. Here it is in its latest form. 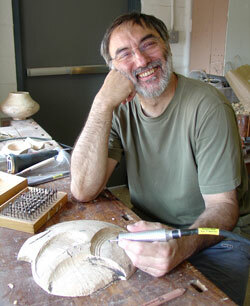 Jean-François has finished his three ailanthus bowls. Here they are. He cannot quite hide the break in the first bowl, so he doesn’t yet know what to do with it. 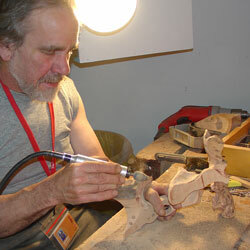 Jean-François and Sean are collaborating on the oak sculpture for which Sean turned the pieces. 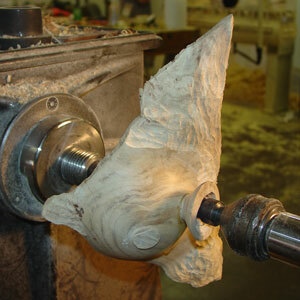 Both are carving and texturing the pieces that will be joined for the final work. 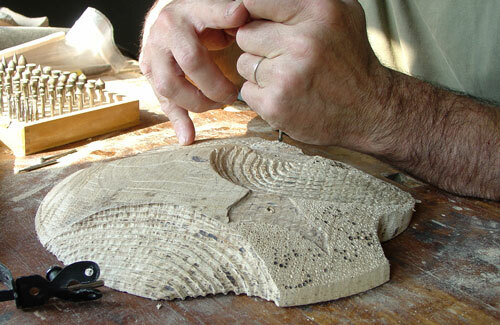 Here, Jean-François is using a Foredom to work (or not) on the disc that will be the base of the sculpture. My large mulberry bowl exploded today. I had just turned up the speed, looked at the dial and thought, “That’s probably too fast,” and it blew up on me. The glue joint at the waste block gave way. Fortunately, no one was hurt. 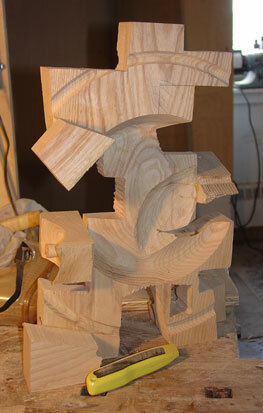 Sean took the largest pieces to use in one of his freeform sculptures. No, no photos of the explosion or its aftermath. After picking up the pieces, I picked up a log of Cryptomeria japonica instead. Now, as it happens (thanks to Gus and the cosmos), I’ve gotten wood from three important species of Japanese trees here: this one, paulownia (kiri), and Japanese cypress (hinoki). This is also known as Japanese cedar, sugi in Japanese, and it is the national tree of Japan. 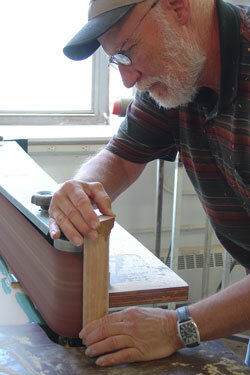 Its earlywood and latewood differ greatly in density, so it is a perfect wood on which to use Jean-François’s texturing technique. 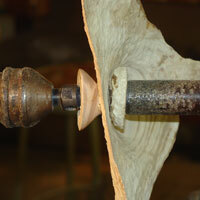 Look at the texture I achieved using a wire brush in a drill. 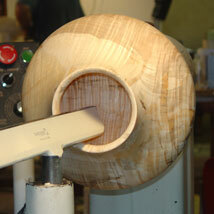 I applied the brush both with the piece turning and turning it manually. Jean-François showed me the trick of reversing the drill as needed to brush with the grain; for all you novices to this technique like me, this greatly reduces the fuzz inevitably raised by brushing. Jean-François took these photos of Siegfried and me working on Sunday. Oh, wait. We weren’t there. Siegfried went off to tour the city on his bicycle. I went to the Philadelphia Museum of Art, which was downright inspiring. Unfortunately, I left my camera at the shop in case anything exciting happened while I was gone (which is how Jean-François took these pictures), so I can’t share any of what I saw. I may go back just to take pictures, though. There are pieces I want to remember. While we were gone, Sean and Jean-François spent the day working. Jean-François turned his third bowl of ailanthus. Sean, who, as I said, likes to move back and forth between projects, was working on the first freeform sculpture when I returned from the museum. (He has begun gluing up a second and third.) 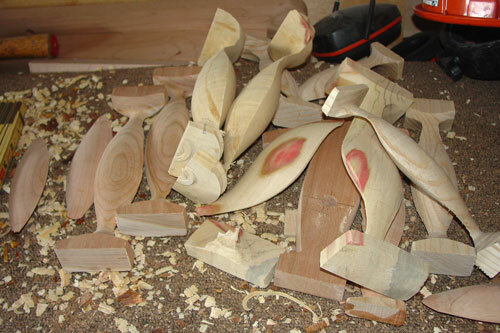 In the second photo, you can also see a piece or two of those he will assemble together in the oak piece he started yesterday. This looks like a hybrid animal from this side. The piece morphs each day. 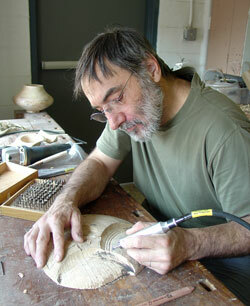 Jean-François was hard at work most of the day on his first ailanthus vessel (he plans three). He tried different wire brushes for texture and ended up using a very aggressive brush he brought with him from France. He used an Arbortech blade to make the rim irregular, then proceeded to work on thinning the wall. “Ooops” is apparently an international word. But no worries. 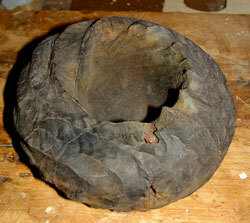 After repairing the break with help from Sean, Jean-François pressed on with bowl number two. Sean likes to have several projects going at once. 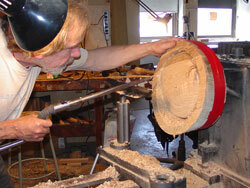 He set aside the burl vessel to start a piece of burr oak. 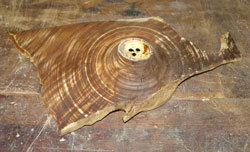 From the chunk of wood you see on the lathe, he turned a ring and a disc. He later cut the ring apart. 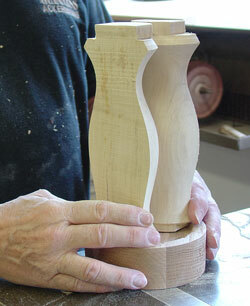 He’ll carve the pieces and later put the pieces together in a sculpture. 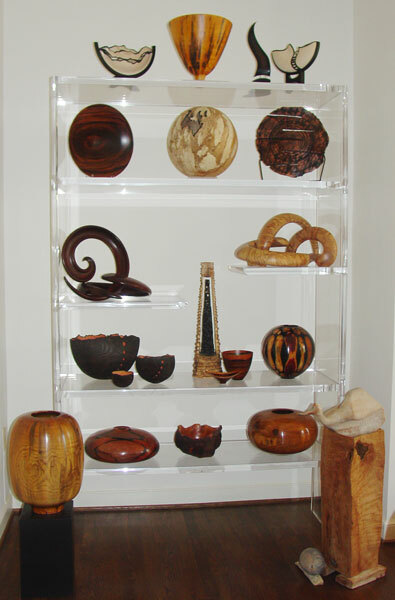 Siegfried expanded his horizons by beginning to carve a bowl he turned from a piece of dry horse chestnut that he brought with him from Germany. 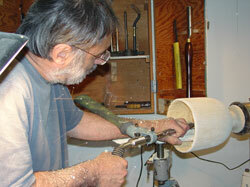 He also continued work on the silver maple vessel. 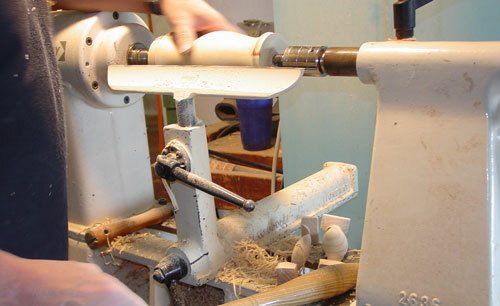 He has the exterior established and is working now on hollowing it—before it gets too out of round from drying, he hopes. I hadn’t intended to turn today, but when I went to the shop I got pulled in. 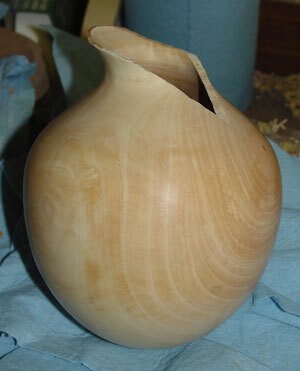 I started a second mulberry vessel from a large, checked quarter of a trunk. I love working the wood. It’s very yellow now, but the color will deepen to a dark russet. I know exactly what I want to do with the cracks in this piece. 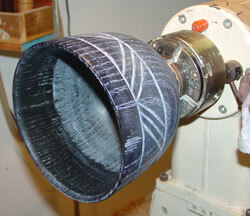 Once I established the basic outer shape, I glued it to a waste block mounted on a faceplate. Then I had to leave, because I had to let the glue dry. These are some of the pieces I’ve started since arriving. 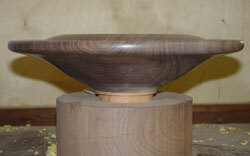 The dark bowl is walnut, my Siegfried bowl. 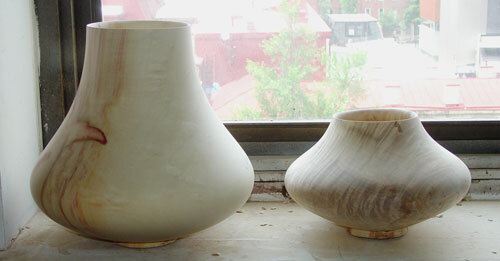 The second, lighter one is a round-bottom bowl of wet pear. I wirebrushed the exterior, but the texture is subtle. 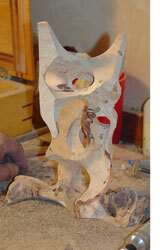 I plan to do some carving with the Foredom to add more texture. 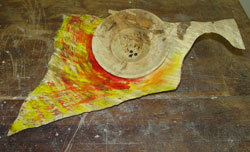 You can see the movement of the wood as it has dried. 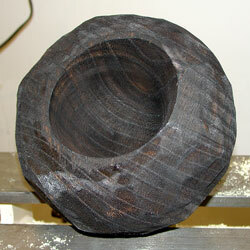 And the last, still mounted on the lathe is the second mulberry bowl.